This is a nice one. I’ll organize my time. The thing is , I’m not confident enough to take the exam (CCNA R/S). can u help me out… there is any thing that helps to boost my confidence. Confidence can be difficult, particularly on your first Cisco exam. First off, given your question, I’d suggest that you consider taking the two-exam path to CCNA by passing the ICND1 exam and then the ICND2 exam. That lets you break the material in half, with less volume to study for. Second, practice applying your knowledge. That means: lots of repetition doing labs, lots of practice questions, lots of paper exercises, and any other review exercises that you can find. And when you answer a practice question and don’t confidently know the answer, stop, research, and figure out the details until you are confident in the answer. Finally, when working through that final preparation, engage at the Cisco Learning Network. Look around for posts of people asking how they gained confidence, what they did that worked to help them pass, and so on. There are lots of prior posts in which people state what they did that worked for them. On configuration, pick the top 10-12 topics that can be configured, and practice them on paper in your spare moments, until you can do those in your sleep. And of course, practice sub netting and the related math until it’s automatic. That sounds like a lot, and it is. But if you can get the right answer on sub netting math every time, configure the major topics correctly and quickly every time, and you fill in lots of holes in your knowledge by using lots of practice questions, then your confidence should grow. This was an interesting post. I agree with the notion that passing and then maintaining a certification pays off in dividends. The hours spent studying do not need to be repeated whereas a part time job needs to recur to maintain the additional income. Wendell, do you have any current or upcoming posts regarding the new CCNP tests? Finally, thank you for all that you do. Your CCNA books and simulator were my primary study material while preparing for the exam. They helped launch my career further than I thought possible in a short period of time. Thanks much! Always encouraging to hear of people getting going into networking. It’s been a looong time since I first started out, but I remember that excitement, and it’s great to hear peoples’ stories. As to your question, I did a brief overview of the new CCNP R/S around the announcement time (another blog space), but didn’t have much planned there, partly because I’m out of the writing loop with that cert. ping me somewhere on social media if you can’t find it. I have thoughts about this b4 but you have just clarified my Idea about it. Cisco’s/ CiscoPress Literature, Blogs & Documentaions on IT Networking Technologies are the best in depth and quality content. It has a huge Cult Following and is The De facto Standard for anyone entering into the IT Networking Domain or the TCP/IP space. Even Corporate traniers for various IT Networking, Network Programming and Product Support Companies recommend CiscoPress books to gain insight and knowledge on Computer Networks. Afterwhich, they will concentrate on their respective Product Tech training. Thus, every Network Engineer I have known for the past many years in some way or another will be loyal & inclined to Cisco Systems and it’s IT Networking Technology adavancements/ achievements, plus they will find the Competitors networking technologies incomplete, inferior and lack of feature set when compared to that of Cisco. Hence, this will automatically built trust and respect for Cisco Systems Inc. which other companies lack alot (Recently, #EMC #VMware realized the same & is trying to enter IT Networking market by pushing forward it’s own IT Cert for SDN NSX to gain faith and trust for it’s technologies from the existing pool of Network Engineers who are currently knowledgeable in Cisco Products and Tech http://searchsdn.techtarget.com/news/2240228172/VMware-calls-future-NSX-certifications-the-next-gen-CCIE). But Competitors currently don’t have a huge fan base when compared to that of Cisco’s. This is Cisco’s most powerful Advantage. I strongly believe this is the major selling point for Cisco as Enterprise/ Business CIOs/ CTOs, Enterprise IT shops, IT technocrats educated with Cisco Tech/ Products will trust cisco products for their innovations, efficency, reliabilty, stability and scalability. Which will promote them into Decision making tending towards choosing Cisco Products and Buying Cisco Equipments for their TCP/IP requirements to fuel Enterprise growth in the current information age. And that courses in that link you posted… very interesting. It indeed sounds like a great course for Cisco networkers! I just embarked on the journey of Cisco certs. I recently purchased your cisco press book for CCNA R&S, its simply awesome and I enjoy reading it. I’m here to say that this purposeful blog post and several useful coments from fellow readers provided me with insights on value of certifications and money. I want to go for CCIE R & S and later for CCIE Security. One thing which I can is, spend your time wisely based on your needs and also never get off the track of your long terms goals(CCIE’s in this context). They pay off much more than you can expect in he long run say 3-4 years. Glad you enjoy the books, and happy to be of service! Keep up that enthusiasm – hope you enjoy your studies towards CCIE! This does not include the CCIE fairly. For validation of your efforts and monetary sacrifices this graph would need to incorporate the CCIE pay grade. I understand that isn’t the point as its just a visual representation of time vs money. I would be interested to see the time line and earnings of all incorporated in a 3400 hour graph. I believe the true value of the CCIE will be better show then. As time increase the value of the CCIE will trump the 1700 hours within a very short time. I am writing my practical in 2 months and studying it full time. Thanks for the post, and feedback on this tool I’ve thrown out for discussion. If by “fair” you meant it doesn’t include all aspects of the value of CCIE, I agree with you completely. But your comment (and a few others) have gotten me thinking more about the tool zeroing in on the comparison of study labor to part time job. For what I was shooting for, I think to focus your comparisons on CCNP, you do the math for the hours that just completes CCNP (700 in this case). To focus on CCIE, then use the 1700 hours case. And you could even extend to dual CCIE even, maybe add another 1000 hours. The idea being: expend study labor and end with a higher cert, or end with the lower cert and some cash. We would all prefer to have the higher certification, but at that point, would the lower one plus the cash be better (to a particular person)? Or pick your own pay rate guesstimates. Well being a CCIE is an honor. It is not out the Salary . It is about reality, self satisfaction and respect. I am not a Cisco Certification Holder yet. I am just pursuing CCNA R/S.. and I have set a goal for my carrier is to be CCIE. This is my first step of Networking Carrier. Wendell Odom, Sir I need your few suggestions that what steps i should take to get the level of CCIE. First, it’s great to have a solid goal. Write it down. Share it with a close friend and colleague or two. Put those goals in any education or development plan you have at work. And work the development plan! The path from CCNA to CCIE will take time, and you cannot sprint the whole way. Just keep at it! I’d suggest that if CCIE is the goal, that taking a little more time to study for CCNA and CCNP, rather than rushing through them just enough to pass, makes For CCIE, you will have to learn a rather large width and depth of topics. So, learn CCNA and CCNP topics thoroughly while you are there. That’ll make your initial steps in each CCIE area of study a little easier. I wish you well in the journey! Hi, good post, but i think the forth option which is 1700 Hours for CCIE is the preferred as per my prospective, and i think it not all about the earning money rather then self-motivation and self-development is the main goal in all the individuals career, i as a being CCIE Certified always want to develop my knowledge by prioritizing the tasks/work and give time to persue my second CCIE, which i am doing it and as i got my CCIE my earning is double then was as a CCNP certified, i think both knowledge, industry certification and experience count on the amount of earning. So overall 1700 is worth to spend and still need more to spend on other tracks as well. Nice! So not only choose CCIE with the 1700 hour exam, but keep “spending” those hours investing in the next cert, next CCIE even. Inspiring opinion! Hope your 2nd CCIE study goes well! Josh I would say then you’re at a company that doesn’t use Cisco products or they don’t value their employees. If an employer downs plays your achievements then wants to use your number for discounts then you’ve been duped. I have been at my company for 5 years plus and am maxxed range for position. Being a CCIE is worth not 1 penny extra other than a minimal $$hundred for passing a certification test. Ditto for CCNP or other non base CCNA cert and if you use time at work to study you are actually going to be less productive on my team. Great post, however, this doesn’t apply on Guatemala, i earn $6.75 per hour, i’m CCNA RS, CCDA, and i spend a lot of time studying, and now I’m studying for CCNA Security i took around 6- 8 hours a week studying i’ve been studying 5 months XD i planning to take the test on octuber. Sounds like you be somewhere around 175 hours of study for CCNA Sec? I had been guessing about 150 hours or so for the 2nd, 3rd, etc CCNA, so that’s some good data. Thanks! Hope the test goes well. On whether the example doesn’t apply in Guatemala – just substitute your own choices for typical pay rates, even in local currency, if you otherwise like the model. My opinion: the value of CCIE is obvious. If we will add to your chart only 300 hours more then we see that we can in the same time earn almost as much as without any certificate + make CCIE. I assumed that CCIE will earn ~$60. The more hours taken under calculation – the more valuable CCIE is in the longer period of time. I know this sounds like I’m beating the same old drum … but this is exactly why I mentioned that the view was a little too simplistic! Take it from a perspective employers view point. Sure there are situations where you need the CCIE to make the numbers for a Cisco credential. However, typically, the reason why CCIE would be listed as a requirement is because it assumes that to hold that level of qualification you already have considerable experience – not just gained through the process of achieving the CCIE, but real live operational experience. The increases in what a potential employer is prepared to offer is almost always based on the increased experience level that a person with those certs would have, they’re rarely going to be paying for the certs in isolation!! A CCIE with no experience is likely to have trouble finding a foot hold as they’re too knowledgable to place in an entry role to build that experience, but don’t have the wider skills and experiences required to hold those all so important CCIE positions. This isn’t just CCIE of course, the vicious cycle of experience vs education is well known by pretty much every school leaver! One final observation, you also need to take into account not just the cost of the time, but also of the resources. Serious study at this level requires access to training material, books, a lab, classroom/bootcamps to help reinforce the material, not to mention the cost of the exams, travel etc. I certainly wouldn’t try to talk anyone out of it, but the reality is that there always has to be a balance. CCIE is also in my road map but it’s more of a personal goal than something that I believe is going to radically change my income. On your last paragraph… don’t forget the absolute values rather than the relative. I picked $10, $20, and $40/hour based on what what I’ve seen people get paid on contract with CCNA and CCNP (around $20 and $40), and guessing around $10/hour for working the sub shop. it just happened to be 1X/2X/4X. FYI. Thanks for the numbers! I went through a few scenarios like that as well (actually put $80/hour on the CCIE in my guesstimates). Indeed, at some number of hours, no matter the hourly rate above $40, the CCIE of course catches up, plus you have the CCIE and all that means. As a tool to put a number on the cert based on labor, I think moving the number of hours the other direction is maybe more interesting. Say… 700 and 1400? Maybe I should have approached the problem with a little more attention to that last case. Let’s face it, many people find the leap from CCNP to CCIE to be too much – too much time, money, effort, too difficult, too much distraction from real life. But the value of CCIE is high. So maybe that’s where I head for a next blog post. Great, Whitney! Thanks for playing… And sounds like you’ve got some good strong motivation here starting out. If you think of it, let me know how the studying works out once you’ve gotten through CCNA! Interesting to see how it goes and how many hours I spend in study for the CCNA. It is certainly an interesting approach about how to determine “value” but does seem to miss an important little “gotcha”, and places quite a high bias on time! “Yes, you have CCIP and CCNP, extensive experience in routing and switching …. but have you ever logged into a Cisco 6500 or configured a Nexus 7k at 3am”? Clearly a nonsense question as each environment is going to offer something different. With a solid foundation the learning curve is hardly insurmountable, but that doesn’t seem to matter! I can understand to some degree, and things do get better if you can break the cycle, it’s just not that straight forward. My second “problem” is the model itself! clearly it’s vastly simplified as each opportunity runs to the same composite number of hours and is looked at with the benefit of a “guaranteed” return. Based on this logic alone then clearly if you know in advance that the hourly rate you can get for your skills as CCNP is 4x what you can get without the study then it’s a “no brainer”. … so where does that premium come from? * to formally baseline your competence level. Thanks for the thoughtful feedback! Truly, it was an exercise in thinking in a new direction. Thanks for giving specific reasons as well! I am 28 and had some problems in the past. Now it is like a new beginning for me, a restart of let say everything and of course a possible networking carrier. I only have a CCNA(passed before a couple of years) and now I am focusing on Security. So the answer is NO. It is never too late if you want to do smth and feel confident about it. Hi was a very interesting article, I never see the value of cisco certifications of that point, I am in the worker 2 position a year ago I obtained my CCNA R&S certification and now I am with a full time job and I want obtain more certifications but I do not have enough time for study like a lot of people my goal is be a CCIE in some time but I feel I am going very slow to my goal, I have planned make a couple of certifications more before to going to CCNP cert, now I am study to obtain the CCNA Sec but I am taking more time of the estimated. 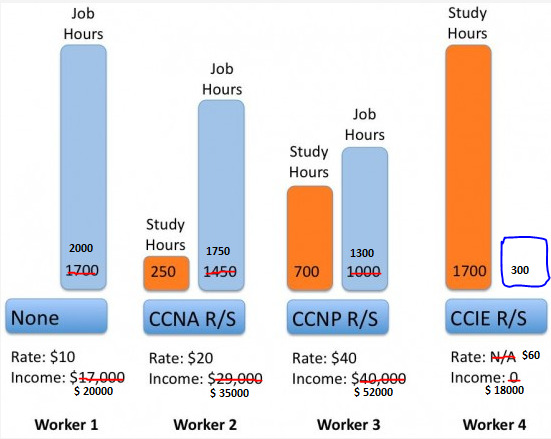 About the figure I think the worker 3 is the best option but being in that position you can go for the next level CCIE with the difference you will have to take more time of the 1700 hours but is something relative because with that knowledge you earn more money with the time. Your post brings to mind an old saying that we overestimate how much we can accomplish in the short term, but underestimate how much we can do in the long term. I hope you can finish the certifications you’d like to achieve in the long term – but in the short term, try not to get too frustrated. Set reasonable goal, but set them, and try to stick to them. That’s my (unasked for) advice! Thanks for the comment. This quote sums a lot of the people around me, too often I see them trying to achieve a long term goal in a short period, failing, then instead of continuing to pursue the goal they give up and go back to their old ways with the impression that they will never be able to reach their goal(s). Yet, if they were to continue, taking small steps at a time they would achieve much more than they initially intended. I enjoyed this article, it’s a great way to look at not only Cisco exams but any personal development one is trying to achieve. I have just recently achieved my CCNA-Voice and with CCNA-R&S already under my belt I have started studying for CCNP-R&S. I viewed this article not with a part time job but with another long term goal I’m working towards (not career related). At them moment I am sitting somewhere between worker 2 and 3. I would like to move more towards an even amount of time spent on each goal say 1 1/2hrs on one and 1 1/2hrs on the other – Currently it’s around 2 1/4hrs on only 45mins spent on study (per day). Thanks, Leon! It’s encouraging to hear an example of someone executing on their long-term plan, and even that they have one! I’ve been looking at some other other numbers along the same line of this post, and at some details of study activities and choices for that cert part of that long-term plan. Maybe one of those will end up in my next post here. And if it’s 45 minutes a day for CCNP, I love it that you’re thinking per day, and not just one day a week, say half your Saturday. That really helps retention! Age 30 is plenty early to embark on a career in IT. Even if you hope to retire early, say age 60, that’s a good 30 years in that career area. I’d say it’s well worth it. As for job market outlook, I’m not an expert at watching the market, but I do have an interest. Here’s a couple of links that give some perspective. Also, there’s some interesting job outlook data spread around here at cisco.com if you look a bit. And here’s a generic bit of study from the US Dept. of Labor, looking at the long term outlook. I’m 30 and thinking of pursing a career in cisco networking. Is it too late? Is this a career that could last a lifetime? What’s the job outlook? Well Cisco is a pioneer in the field of networking and getting any of this certificates not only helps us to increase your income from networking profession,but also helps you use standard methodologies and professional approaches ! Soud – first, hope your lab goes well next month! A year off to study and get to CCIE – wow. What do you think of my time estimates – are those anywhere close to what you will have spent by the time you take the lab next month? Thanks for jumping in to comment! And on your “more challenging projects” comment, an old boss of mine at Cisco said that was one of his best tools for keeping his best technologists motivated – like feeding candy to kids. Thanks again! Not really something you can measure financially. I would say though that the CCNP is a great stepping stone. It’s high reward and will give you a feeling for the effort needed for the CCIE.